Are your drain covers being stolen? Is your plumbing system compromised by staff and night cleaning crews who wash food and trash down your drains? 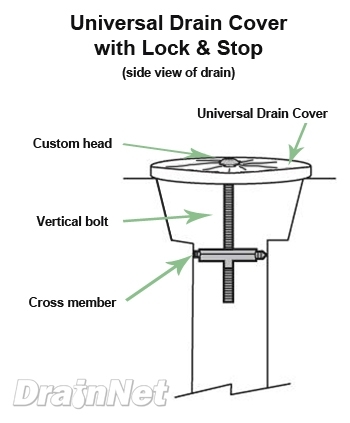 Drain-Net has the perfect solution to this common plumbing problem with this Universal Locking Drain Cover. This product was developed by combining the technologies of our very popular Lock & Stop with our Universal Drain Cover. Now restaurants, commercial kitchens, and other facilities can replaced and lock down their drain covers once and for all. The crossmember which lock the unit into place can expand to fit drain. Simply measuring the ID (inside dimension) of the drain. A screwdriver is all that is required to install the drain cover. The insertion tool for the Lock and the security drill bit is provided. To select the right size, first measure the inside diameter of the drain pipe. This will tell you what size Lock and Stop you need. Choose between 2", 3", and 4". Then measure your existing drain cover. If there is no drain cover, estimate the size you need. Choose either the SMALL cover or LARGE cover.